Love Can Survive Anything… Even Family. SANTA MONICA, CA (December 21, 2015)- Academy Award® winners Alan Arkin (Best Supporting Actor, Little Miss Sunshine, 2006), Diane Keaton (Best Actress, Annie Hall,1977), and Marisa Tomei (Best Supporting Actress, My Cousin Vinny, 1992) team up to rediscover the power of love across every generation in Love the Coopers on Digital HD February 2 and Blu-ray™ Combo Pack (plus DVD and Digital HD), DVD (plus Digital) and On Demand February 9 from Lionsgate and CBS Films. The heart-warming comedy that reminds audiences what family is all about also stars Golden Globe® winner John Goodman (Argo), Ed Helms (The Hangover), Jake Lacy (Carol), Anthony Mackie (The Hurt Locker), Amanda Seyfried (While We’re Young), June Squibb (Nebraska), and Olivia Wilde (TRON: Legacy). 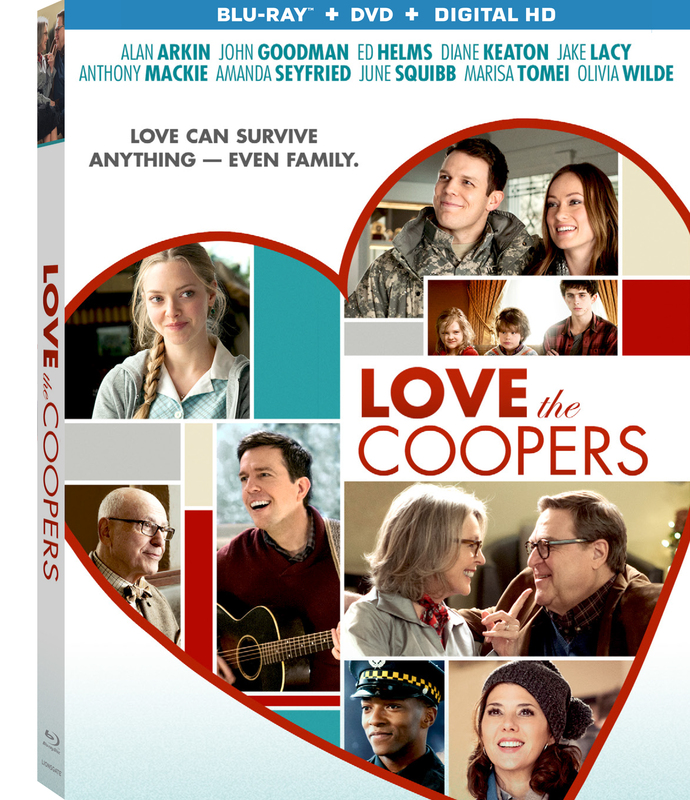 Loaded with laugh-out-loud special features including a behind-the-scenes featurette and music video by Alison Krauss and Robert Plant, Love the Coopers will be available on Blu-ray Combo Pack and DVD for the suggested retail price of $39.99 and $29.95, respectively. Title Copyright: ™ & ® CBS FILMS, CBS and Eye design and all related logos are marks of CBS Broadcasting Inc. Love the Coopers © 2015 CBS Films Inc. All Rights Reserved. Artwork & Supplementary Materials © 2016 Lions Gate Entertainment Inc. All Rights Reserved. Rating: PG-13 for Thematic Elements, Language and Some Sexuality.